These are one of my favorite treats when the garden is brimming with Zucchini. I make them as patties (shown below) or little medallion fritters. They're good hot or cold and I've made them for staff meetings and board meetings; definitely a treat for vegan and omni alike. Grate and peel the zucchini. Place in a colander and toss with a tablespoon, or so, of salt. Be liberal with the salt. You'll rinse it off anyway. Set the zucchini aside to drain for at least 30 minutes. Place the bulgur in a bowl and cover with 1 cup of boiling water. Let set until the zucchini is ready. After 30 minutes, rinse the zucchini. Squeeze out as much moisture as possible. You can squeeze it between your hands or press it between two plates. I usually squeeze it in my fist, then ball it up in sheets of cheesecloth and squeeze again. The drier the zucchini, the better the fritter will be. Combine the remaining ingredients and stir to combine. The gluten will form stringy strands and clump, but it will not make a dough. If necessary, add a little more gluten. Put a cookie sheet in the oven and preheat it to 400 degrees. 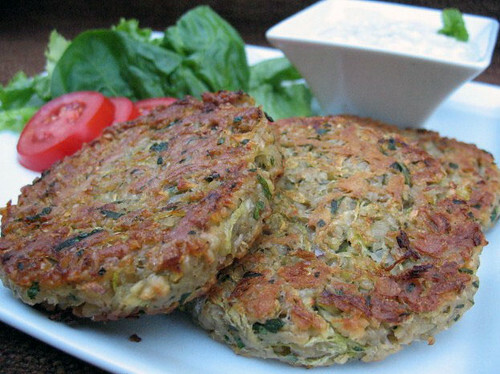 Form the zucchini into 8 patties (1/3 cup ea) or 15-20 medallions (2-3 tbs ea). When the oven is preheated, take out the cookie sheet, pour on enough oil to cover and place the patties or medallions onto the sheet. Bake for 20-25 minutes, flipping half way through. Remove from oven and serve. They are good hot or cold. AWESOME! These look really tasty! You reckon I could sub the bulgar for something else? Oats maybe? Jeni, Other grains should work instead of bulgur. You may have to adjust the liquid content a little. In the past, I've used bread crumbs and cooked quinoa. Bulgur is my favorite, though. About how many cups of zucchini is "3 medium?" Thanks! They look amazing!!! What would one use instead of vital wheat gluten? I have a wheat sensitivity...Thanks! Anonymous: I'd call a medium zucchini something an inch or so thick and about 8 inches long. I'd guess it would make 1 1/2 to 2 cups shredded. mmmorgans: I've used quinoa instead of bulgur, but it doesn't have much binding ability. I think I'd substitute the bulgur and gluten with crumbs or flour and mashed beans or even lentils. Really overcooked rice might work as well. If you find something, I'd love to hear back. I am making these for dinner tonight! Zucchini is salted as I type this! I couldn't resist, the photo looked so good. These are amazingly good! I wasn't sure how the gluten would be. The texture is wonderful and binds together so nicely. Thanks for sharing!